One of many conversions of the famous block-stacking game available for Nintendo's home console, this one is based on the 1988 coin-op version produced by Atari Games. The goal is to place pieces made up of four tiles in a ten-by-twenty well, organizing them into complete rows, which then disappear. As rows are cleared, the pace of the game increases, and the game ends if the stack reaches the top of the well. The game features a standard endless mode, as well as a two-player competitive mode where players race to complete each level. There is also a "cooperative" mode where both players play within the same well, working together to complete lines. Both the competitive mode and the cooperative mode can also be played with the computer. 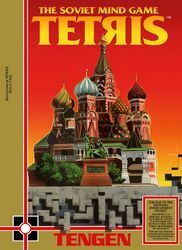 The game offers standard starting-level and garbage options, several different background music themes, and cute little Russian dancers to congratulate you between levels.